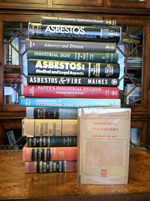 Occupational Disease risk from historical or present day exposure to a broad range of toxic materials, including asbestos State of the Art and Exposure Assessment expert witness services. Workplace Injury and Wrongful Death Litigation involving occupational safety and industrial hygiene management practices, corporate governance processes and standards of care. Construction Defect Litigation related to water intrusion and occupant exposure to "toxic" mold, including hospital construction infection control risk assessment and nosocomial (hospital-acquired) infection litigation.